It was the dawn of the ballistic missile era, and with the invention of the V2 rocket, the Germans had beaten everyone to the punch. Eager to get their hands on one of these horrific new devices, the Allies embarked on an audacious plan to steal one. Here’s the fascinating story of how they did it. Indeed, the potential for the Peenemünde Aggregat A4 V2 rocket to be a game changer in the war was not lost on the Allies. It was a weapon from the future — an advanced piece of technology that Hitler saw as the deus ex machina he was looking for. When Wernher von Braun showed him the launch of the V2 on color film, Hitler reportedly jumped from his seat and shook Braun’s hand with excitement, proclaiming, "This is the decisive weapon of the war. Humanity will never be able to endure it," adding that, "If I had had this weapon in 1939 we would not be at war now." Production and testing of the weapon began in October 1943. To create the tunnel system for the production factory and to build the V2s en masse, the Germans relied heavily on forced laborers from concentration camps. Some 60,000 prisoners were used, many of whom died of starvation, cold, and disease. 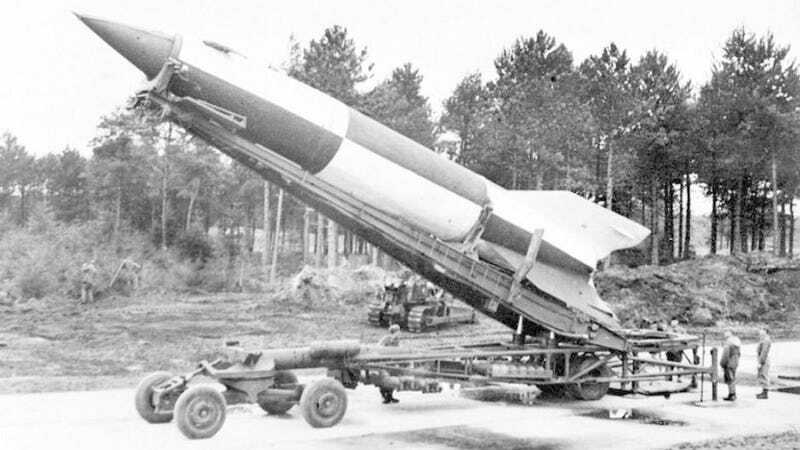 At first, the Germans produced about 500 V2 rockets each month; their plan was to increase that figure to 900. Given the rocket’s 236 mile range, its Mach 5 speed, and 2,148 pound payload, the Nazis were hoping to bomb their way to victory. But the Allies were well aware that the Nazis were up to something. Reports from Polish intelligence indicated that the Germans were designing some kind of secret weapon at Peenemünde, the exact details of which were not entirely known. Not willing to take chances, the Allies launched a bombing raid in late 1943 to disrupt production. Not content to stop there, and because the location of the research facility was known, the Allies asked the Polish Home Army to steal one of the V2s and ship it to Britain — a task that most certainly would have sounded easier said than done. But patience and luck was on the side of the Poles. In early 1944, a V2 rocket crashed onto a muddy bank of the River Bug near the testing ground at Sarnacki not far from the village of Mezenin near Klimczyce. And remarkably, the V2 did not blow up. The Polish underground, who had been waiting for such a situation, rushed to the rocket and disguised it with bulrushes and osier bed. The Germans, desperate to retrieve it, quickly organized an aerial and ground-based search mission, but failed to locate the now-camouflaged rocket. After the week-long search came to an end, the Poles returned to the site. This time they brought along four Polish scientists who carefully disassembled it and packed the pieces into empty barrels. The parts were then shipped to a barn in Holowczyce just a few miles away. The Polish Home Army then contacted London to let them know that they had a virtually complete V2 rocket disassembled and hidden away. Eager to get their hands on the pieces, the Allies organized Operation Most III, a mission to retrieve the disassembled rocket by plane and bring it back to Britain. As they prepared for the mission, some components (namely the guidance system) were smuggled into Warsaw where Polish scientists examined it, and fuel samples were shipped to London. The Most III operation, also known as Wildhorn III, got underway on the night of July 25th, 1944 — and it would prove to be a harrowing mission. A Dakota C47 piloted by F/Lt S.C. Culliford flew over Hungary and Yugoslavia and landed at a secret Home Army strip in the vicinity of Wal Ruda near Tarnow where they were to collect the chassis and several technical experts. But once packed, the overloaded C47 could not move on the wet, muddy field; it’s port wheel was stuck in the mud. Everything had to be offloaded. The Polish partisans desperately tried to free the aircraft. They tried stuffing the wheel track with straw, and then by laying wooden boards in the trench — but nothing worked. Co-pilot Kazimierz “Paddy” Szrajer then decided that the parking brake must be stuck, so the hydraulic leads supplying the brake were cut. But that didn't work, either; the plane still failed to move. As dawn approached, the partisans frantically dug trenches under the aircraft’s main wheel. After two failed attempts to take off, and with Nazi automobile lights off in the distance, Culliford considered blowing up the plane and burning all the evidence. They decided to make one last attempt. With the trenches complete, and with the engine set to full power, the C47 finally staggered into the air. The remaining Poles scattered into the night to avoid any run-in with Nazi patrols. The flight over Hungary and Yugoslavia took five hours. When landing at Brindisi — and without the use of brakes — the pilots had to land on an emergency runway. The squadron was praised for the “courage, determination and coolness with which they carried out what must be one of the outstanding and epic flights of the war by an unarmed transport aircraft." The rocket components were later flown to England, where the crew was presented with gallantry medals by the Polish Government in Exile, and with Szrajer receiving the Cross of Valour. Sources: Bletchly Park, War History Online, The Summit Times.